One of the most challenging aspects of my job is to work with borrowers who operate in many different industries. Some of the business basics I go over with borrowers apply to anyone in any industry, but to truly be able to help I need to better understand the economics of each industry. For example, where does the raw material come from for welders? What are the informal markets like for selling pigs/chickens and how does that compare to the more formal cattle/sheep/goat/donkey markets? Do producers enjoy regional advantages that would allow exportation to other markets? Can borrowers use their capital to exploit seasonality? 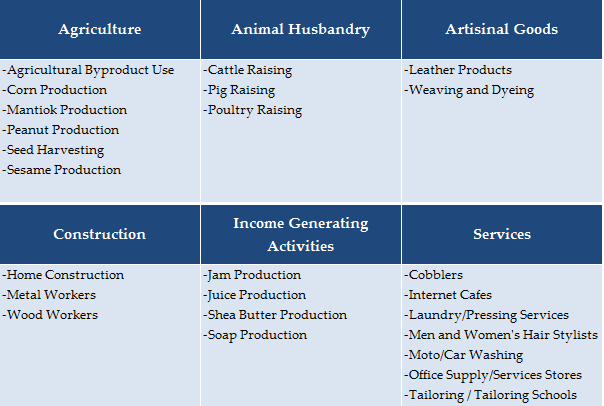 To help answer these and other questions, I’ve decided to create a resource called the Burkina Business Manual that will attempt to summarize the economic drivers of each specific industry in which my borrowers operate. The plan is to interview borrowers in each segment over the course of the next few months to get a good grasp on the true details of their businesses. After I get a few industries written, I will collaborate with other Peace Corps volunteers and also hope to solicit anyone else to add or point me to any pre-existing materials that may be out there. The use of on the ground information regarding day-to-day costs, markets, and external forces will be a great resource for PCVs and any other development professionals working with small businesses in the region. I plan on posting versions of each section on the site and would be happy to open up the reports for public additions. If you are knowledgeable about any field specifically and/or how that might relate to West Africa, please do not hesitate to contact me. This project will likely be ongoing throughout my service, but I plan to have a preliminary version ready this coming November. I actually hadn’t taken a look at the country commercial guide, but was able to find it – thanks for the tip. And definitely considering staying in the development field – we’ll have to chat about that in August in DC!